Welcomed ceremony by community leaders, introduction the community history and anti-dam movement presentation. Six youths from Laos traveled to join Kaenseuaten trip with Mekong school (EarthRights School) which this trip was in Tambon SaIeb, Amphoe Song, Phrae province, Thailand. 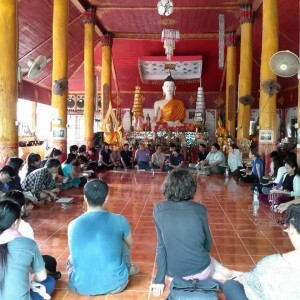 This trip, Lao youths together with Mekong school students had the opportunity to learn how community made successful campaign against Kaengseuaten dam. Importantly, they also learned how essential of public participation (including community members, youths and children) and solidarity among people in the community to fight against Kaengseuaten dam. The youths from Laos were from different parts of Laos and different interests, but they are passionate on youth leadership and community’s participation for environmental protection. 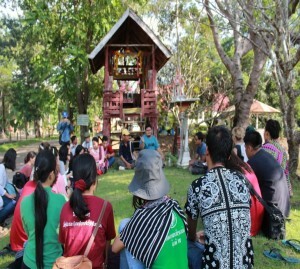 The goals to bring Lao youth to join this trip were building the understanding among Lao youths on public participation, especially on community side (including youth and children) in the decision making process, and they could bring lessons what they have learnt to disseminate or practice in their community. From the first day to final day of the trip, they apperceived the community’s role, youth role and the importance of solidarity of people in the community to overcome the fighting against Kaenseuaten dam to protect golden teak forest and Yom river which are the resources that they have relied on to make their livelihood for many generations. 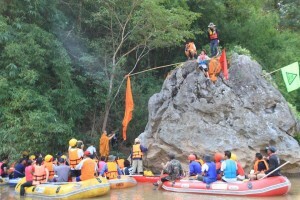 During the field trip, they joined many activities together with Mekong school students such as forest ordination to learn about community forest management and conservation, visited spiritual site to learn about traditional beliefs and culture as the tools to do campaign against the dam project, and did fishing and rafting with community on the Yom river to learn about ecological river and potential impacts if the dam built. From that, They also had the chance to learn about the history of community and the community-led campaign that why they could maintain campaign goals over time. Importantly, community shared other important tools they used to support their campaign such as Thaiban research (community based research), dissemination the information by doing camping and cultural activities leaded by youth group called “Takonyom group”. At the end of the trip, after they learnt many things from community, they shared among the group what they have learned from this trip and discussed what the things they could bring back to their community and the things that are still challenging to bring back to their community. Moreover, they brought the similar issue that happened to their community to share one another to build understand each other better. Visited spiritual sites, learn about traditional beliefs and culture as tools to campaign against the dam project. 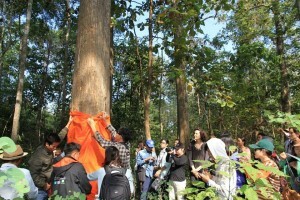 Lao youths who joined this field trip were filled full with many lesson learns from community, especially about solidarity and public participation of community as well as built connection with students from Mekong school which these were youths that had strong intention to build large network of young people in the region to work together with focus on human rights and environmental protection. 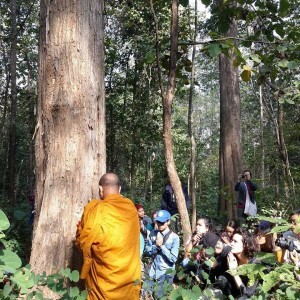 From this field trips to Kaengseuaten community, it might be starting point for those youths to understand and see the issues more critical, which they also expected to build understanding about forest and river management and build their capacity to be good young environmental leaders in their community. Thus, this will be a good chance for them to disseminate the information or knowledge they gained from the field trip to the community, their groups as well as younger generations to motivate those groups of people to participate passionately on environmental protection which also mean to prevent the loss of livelihood of people who their lives depending on forest and river management. Fishing and rafting on the Yom River to learn about river ecology and potential impacts if the dam built.